The CobraMatic 7 Vending Locks provide additional security over traditional tubular locks by utilizing our patented 7-sided key and matching lock front design. The key and lock front will match allowing the lock to function. 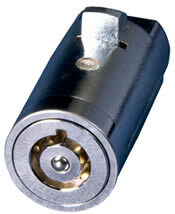 This lock also features 8 user changeable lock codes, the end user can change as needed. Each code is re-usable. Also available in our standard keyway. To see how easy it is to change the lock code on our CobraMatic 7----Click HERE to go to our You-Tube Channel. 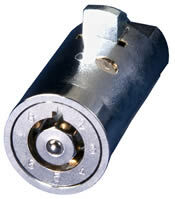 The Cobra7 Vending Locks is a higher security replacement cylinder for the traditional tubular locks. By using our patented 7- sided design we can increase the security of the traditional locks. We add an anti-drill dimple to provide drill protection. Also available in our standard keyway. The Medeco Vending Locks are High Security locks that are designed to enhance the security by providing both physical security as well as key control. 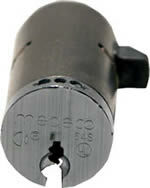 These locks are now available in the new M3 lock cylinders and are virtually pick-proof. Designed to fit all NAMA standard "T-Handles"
The Abloy Vending Locks provide maximum protection from picking and physical attacks by using Abloy's locking discs in a hardened steel body. Designed to NAMA standards, it will fit most T-Handles. Now available in the new Sentry keyway. See our Video "Abloy Locks--One Key--Many Locks"